WARNING: Never look at the Sun without taking proper precautions. Permanent blindness can result from the shortest look through binoculars or a telescope. 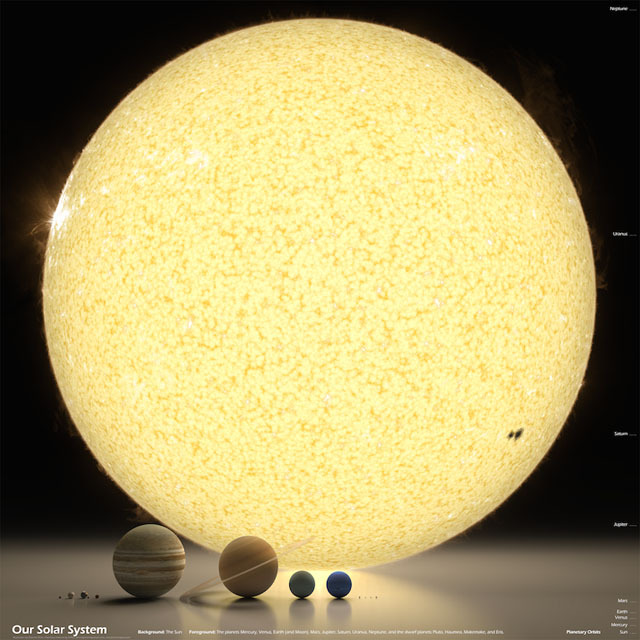 Our Sun is a typical star and it is only because it is relatively close to us that it looks different from the others. Solar observation forms an important part of astronomy because, among other things, it gives us a close-up view of how a star behaves, and how it influences its surroundings. Unlike all the other stars in the Universe, which are very, very, very far away, our Sun is relatively close to the Earth (roughly 150 million km). The Sun is also quite large (about 1.5 million km in diameter) which allows us to see its visible surface as a round disk (about half-a-degree in diameter). The Sun extends far beyond this visible surface, but to see this outer component requires special equipment, often operating at non-visible wavelengths. Visually, we can see sunspots, faculae, solar flares, prominences, and filaments, on the Sun. From time to time, the Moon passes infront of the Sun, and we enjoy the rare spectacle of a solar eclipse. Closer to home, the setting or rising Sun can create beautiful twilight scenes, interacting with the Earth’s atmosphere to decorate the sky with phenomena such as crepuscular rays, the Girdle of Venus, sundogs, halos, and many more. The atmospheric phenomena are easy and safe to observe, but to enjoy the other views, a challenge first has to be overcome: the intense bright light from the Sun. There are generally two solutions: block out some of the light with a filter, or project an image of the Sun. 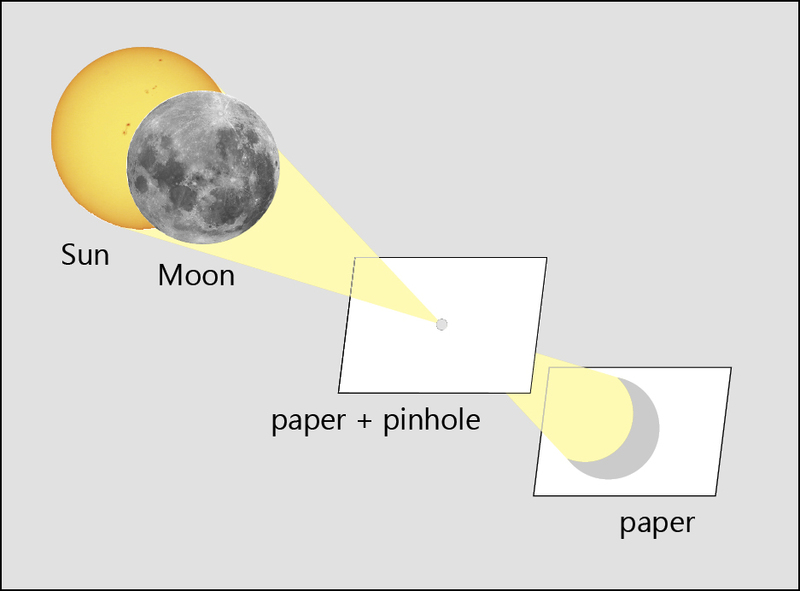 The easiest way of observing the Sun is by projecting its image through a pinhole onto a shadowed screen, as shown in the diagram. A “pinhole” about 1mm diameter (made with a sharp pencil) in a sheet of A4 paper works well if the paper is held about 1 – 1.5m from the “screen”. Smaller pinholes give sharper (but fainter) images. The further the pinhole from the screen, the larger it can be. 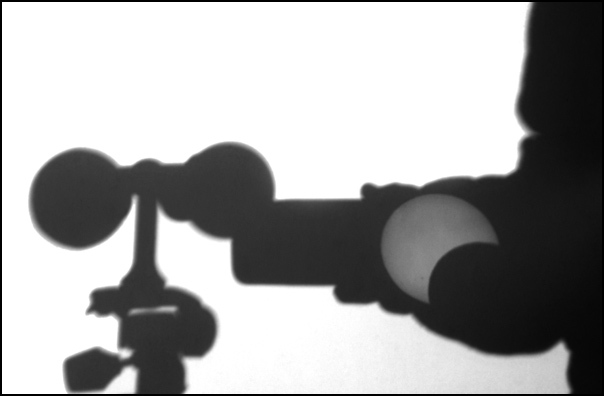 The gaps between leaves in trees give excellent large pinhole images – this is in fact the coolest and safest way to watch a solar eclipse. A brighter, sharper image can be produced if a telescope (or half a binocular) is used to project the image onto a sheet of paper. Keep in mind that the concentrated heat can damage eyepieces, so allow the optics to cool down periodically. It’s also a good idea to reduce the diameter of the lens using a piece of cardboard with a round hole in it, so that the eyepiece is not damaged by the intense light passing through it. And, be very sure no-one looks through the eyepiece at the Sun – this will cause instant blindness. Measuring the size of the Sun with a pinhole! Yes, you can! If you know the distance to the Sun (150 million km), you just need a pinhole, a measuring tape and some grade 8 maths (look for similar triangles). A solar filter is essentially a special material that reduces the intensity of sunlight passing through it to a safe and comfortable level. They also block the invisible (but harmful) infrared (heat) and ultraviolet solar radiation. ISO- or EC-certified optical density 5 (OD5.0) filters are made from either aluminised polyester (“mylar” filters) or carbon-resin (“black polymer” filters). 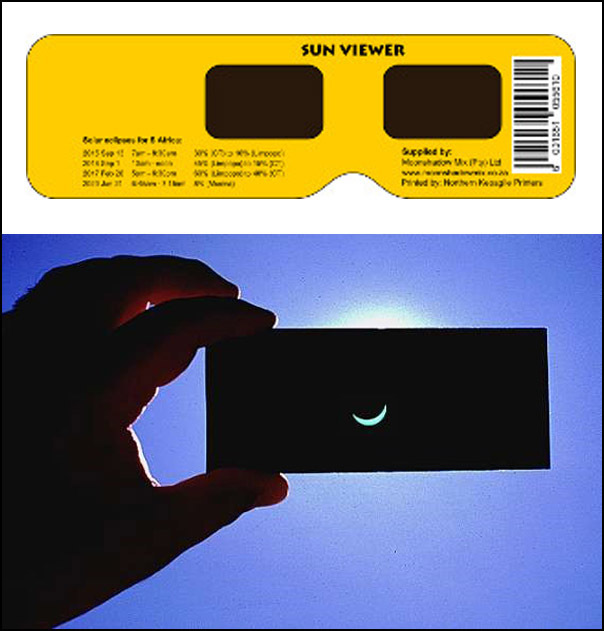 Sunviewers incorporating such filters, for direct viewing of the Sun (without optical aid), can be bought from Telescope Shop (East Rand, South Africa) and online from Thousand Oaks Optical (USA), Rainbow Symphony (USA), Sobomex (France), and Moonshadow Mix (South Africa). A piece of No. 14 arcwelder’s glass can also be used. Whatever filter you use, check that it is not scratched or damaged in any way. Do not use ordinary sunglasses, photographic or X-ray film, or smoked glass. Sheets of the above-mentioned filter materials can be bought relatively cheaply at local telescope shops or sourced online. They are easily cut to the required shape with scissors, and mounted in a suitable holder at the objective (light-collecting) end of a telescope or binoculars. It does not matter if the mylar has some wrinkles – this is only cosmetic and will not impair the filter’s performance. DO NOT stretch it tight to eliminate the wrinkles, as this will damage the aluminum coating, which is providing the protective filtration. 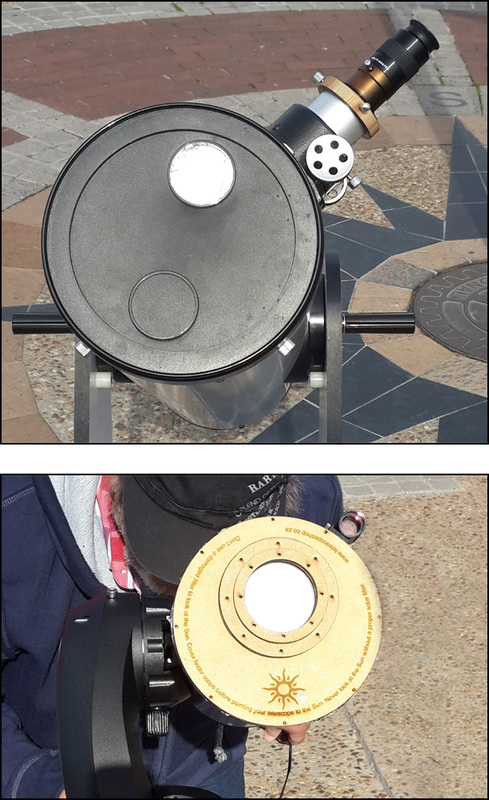 It is only necessary to have filters a few centimeters in diameter; it is better to not use the full aperture of the instrument, to reduce the amount of solar energy being captured. Make very sure that there are no gaps in the filter mounting, and that the filter is firmly attached so that there is absolutely no chance of it being blown off by the wind or accidentally removed. Always inspect the filter for small pinholes and cracks before observing. Damaged filters are not safe and should be discarded. Remove (or filter) your finderscope while observing the Sun. BE WARNED: NEVER use optical aid (telescope, etc.) with a filter on the eyepiece end, as that receives a concentration of sunlight which is so intense that it can burn right through the filter. This includes the dark filters provided with cheap telescopes, designed to screw onto the eyepiece – these may shatter instantaneously from the heat buildup and cause blindness before you have time to react. They are best disposed of to avoid temptation. You only get one pair of eyes to last your whole life, so do not take chances. 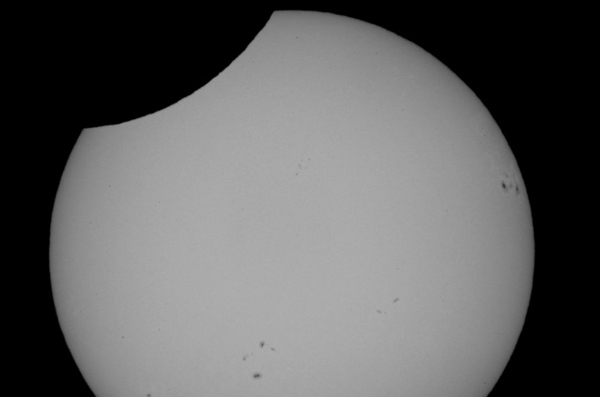 Through a telescope equipped with a solar filter, the entire solar surface can be viewed. Often, sunspots can be seen on the surface, and under good conditions, faculae near the edge of the Sun. During a solar eclipse, the dark silhouette of the Moon, passing infront of the Sun, can be clearly seen through a telescope. 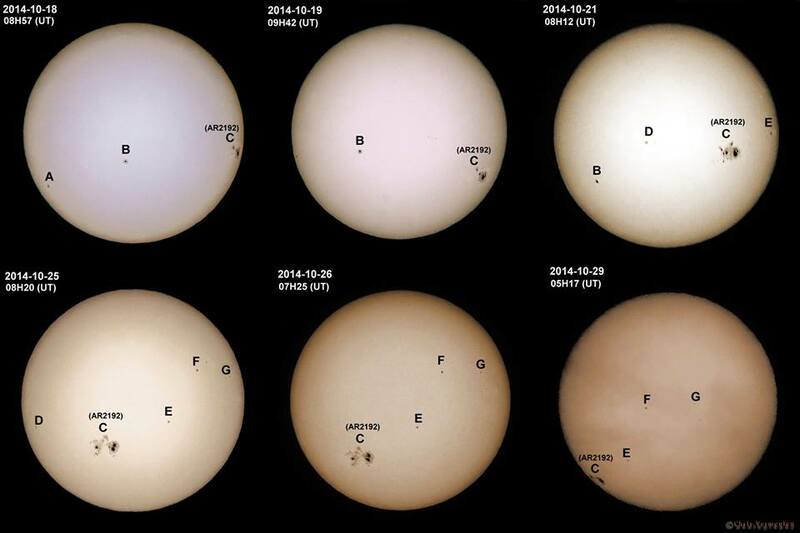 With luck, there may be sunspots visible at the same time! 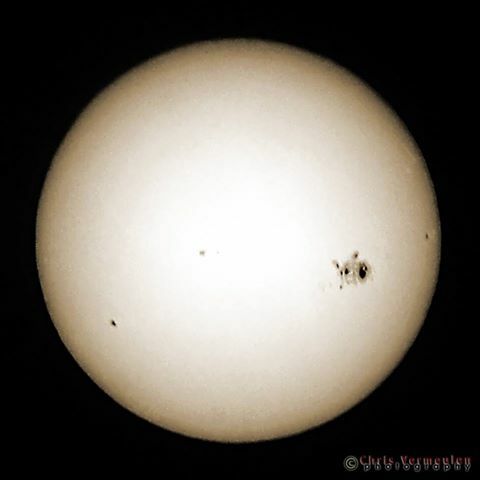 For example, during the 2013 November solar eclipse, Johan Smit photographed several sunspots as the eclipse progressed. Sunspots are temporary features, lasting anywhere from a few days to several months, and appear unpredicatably, so hold thumbs! Download a comprehensive observing tutorial by Jacques van Delft, “How To Observe the Sun“, as published in MNASSA (2006 December). 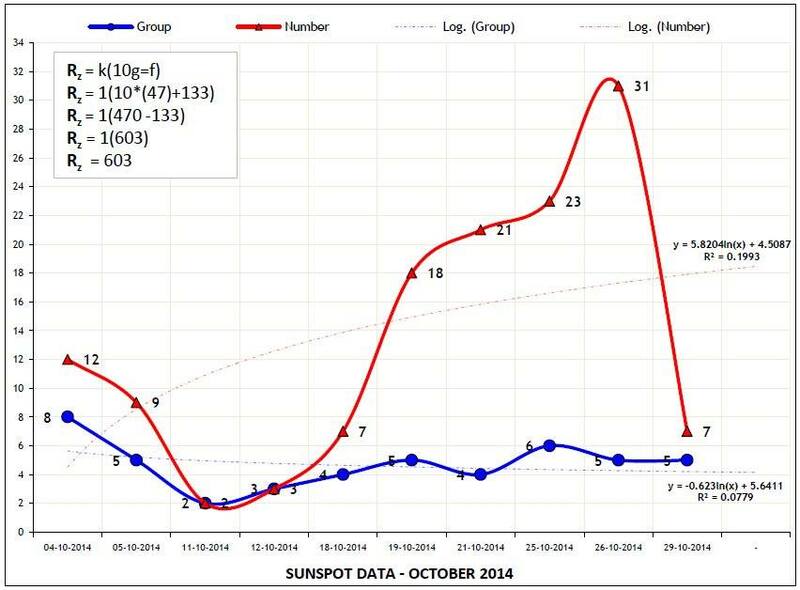 In October 2014 a very large sunspot (AR 2192) was visible on the Sun. Larry Krozel (AAVSO) wrote: “It’s also visible to the unaided eye using a 14 shade welders glass. 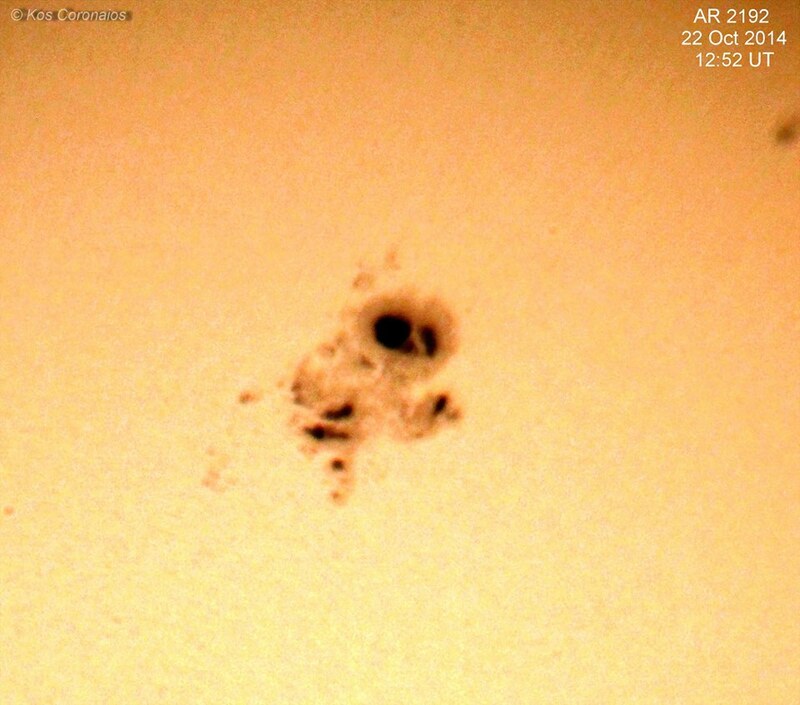 I haven’t seen a sunspot this size in quite a long time, and it is breathtaking through solar scopes!” Observers in South Africa followed the development of AR 2192 with great interest. 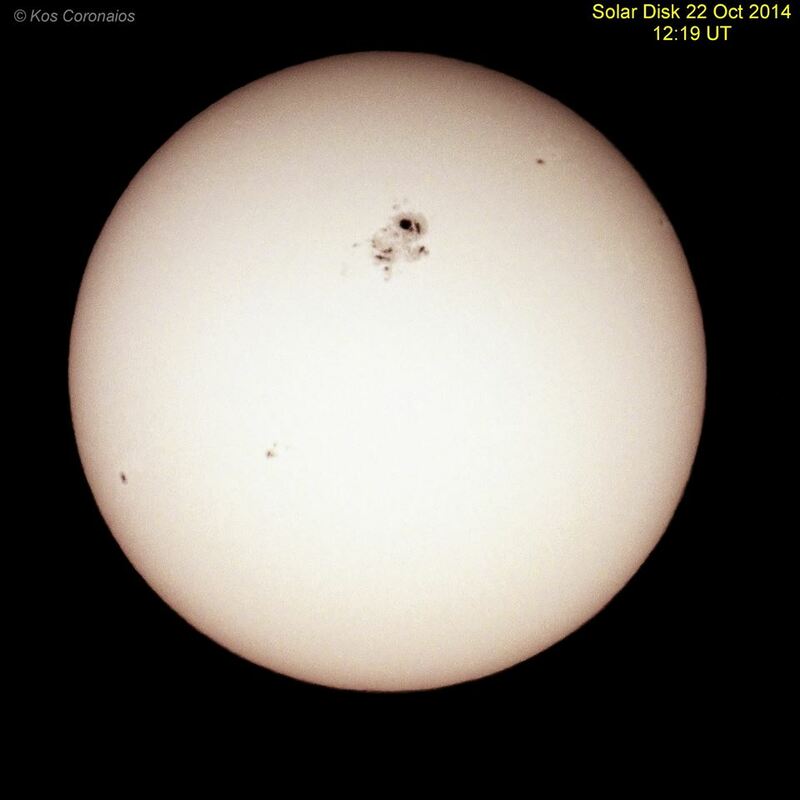 Chris Vermeulen (ASSA) and Kos Coronaios (ASSA) regularly imaged the sunspot; a selection of their images follows.